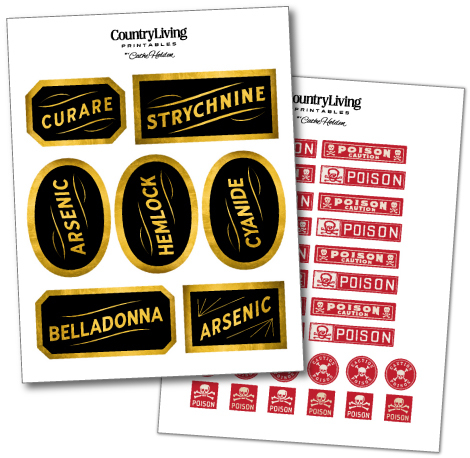 Stepping over to the dark side- a very scary assignment from Country Living- designing toxic antique apothecary labels for you to download, print, and adhere to vintage-style bottles of your favorite libations and other creepy potions in your Halloween decor. The directions are on page 88, and on the Country Living website HERE, along with the free label downloads. Check out all of the other DIY Halloween decorations in the October issue of Country Living! 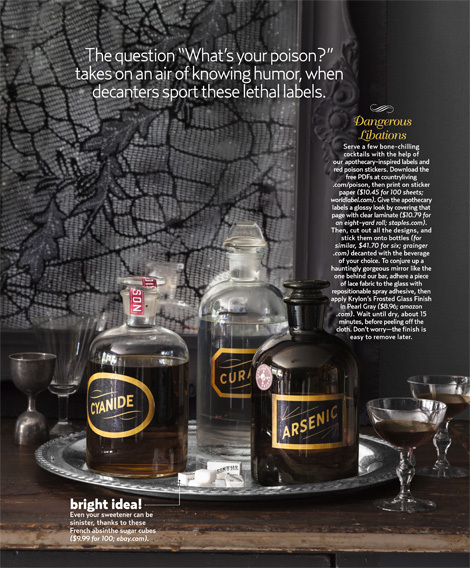 This entry was posted in Country Living Magazine, CountryLiving.com, Free digital downloads, Free PDF files, Halloween, Printables, Uncategorized, WorldLabel.com and tagged arsenic, Country Living, Halloween, poison, World Label. Bookmark the permalink. I was JUST reading this today in CL, love love love this, and the Cary Grant movie too! You’re so creative and talented! Has someone been stealing a lot of your alcohol? These would be great for dinner parties! Love this idea for a Halloween party! 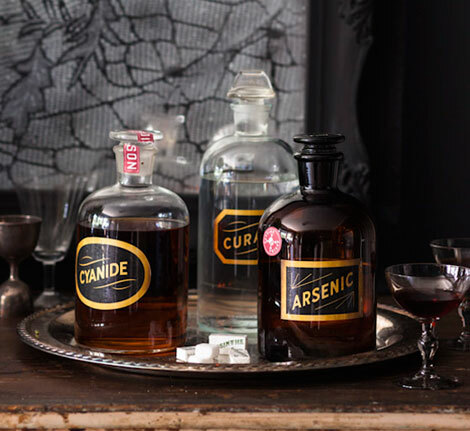 Only YOU could make arsenic look classy. Seriously. I love it! I love your clip art and bottles, but tell me, who did the tatting? 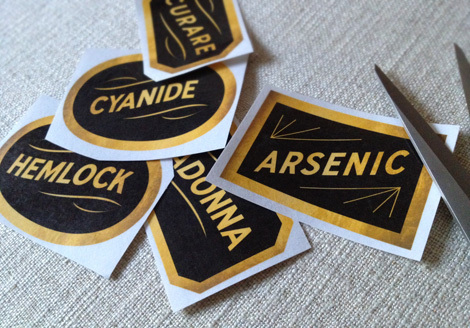 Thank you Cathe for these wonderfully wicked poison labels. How perfect for my Halloween cards and crafts! Cathe,I love your labels, I always find something great every time I visit. Thank you so much, I have shared on my Facebook and Pinterest! LOVE these wonderful labels…thanks for sharing! Hi. Any chance of an update to a source for these graphics? Unable to find on the Country Living website. The link goes to a page for veiled pumpkins. Thank you!